Tony Beech, co-editor of The Wiley Blackwell Handbook of Forensic Neuroscience, tells us how the book grew in the making. Seeing the results of major writing projects like this, I often wonder how they started. Two of my co-editors, Adam Carter and Ruth Mann, were concerned that there was a lack of understanding of neuroscience in forensic psychology and more general correctional practice (including themselves in this problem). They saw a common tendency in risk assessments and formulations, as well as in behavioural management and risk reduction policies, to interpret the causes of criminal conduct in purely psychological rather than biopsychosocial terms. So they approached me to ask if we could collaborate on a project to communicate neuropsychological knowledge to practitioners who work with and make decisions about people who have committed crime. I had worked with Pia Rotshtein at Birmingham University and thought she would be a great addition to the editorial team. We met in my office for coffee, and we all loved the idea, so we sketched out the book there and then. Who did you see as your readership? We originally aimed at practitioners and students, but as the book grew we also hoped it might be seen by academics as a go-to book on their bookshelves. We didn’t originally intend for it to be so big, but as we kept on brainstorming what we would want to be included, we ended up with the audacious goal of producing a book that covered almost everything. And the book covers a lot of ground from a variety of perspectives. How did you set about bringing it all together? We tried to strike a balance between helping people understand neuroscience and its role in criminal behaviour and giving them ideas about how to put this knowledge into practice. There are many areas of criminal behaviour that have not particularly been explored before through a neuroscientific lens (e.g. burglary), and we really enjoyed finding people who were up for the challenge of thinking this through. Along the way, we identified some real ethical, legal and political issues and so we decided to include formal chapters on these issues too. Quite a task… what does neuroscience say about burglars? People convicted of acquisitive offences such as burglary make up the bulk of any ‘offender’ population. General accounts of neurological impairment and impulsivity, including brain injury, ADHD and substance misusing parents, can legitimately be applied to how such offenders are overly drawn to behaviour they associate with immediate reward. So, how long was the book in the making? Over three years, even longer since we first had the idea. Getting authors to agree to contribute and getting the chapters in were truly high points, as were seeing the proofs for the first time. Reading the chapters was intellectually stimulating, and we all learned a lot. But editing for consistency was a somewhat low point. Our authors came from a mix of settings, and the style of the submitted chapters varied as a result. Yes. We divided the work according to expertise and often worked in pairs as editors, drawing on our relative expertise as academics and practitioners, forensic and neuroscience. We were all starting from very different places in terms of our knowledge of the subject. For instance, Pia is a highly respected and well-connected neuroscientist but is not familiar with applied forensic settings. Ruth on the other hand has worked in prisons and rehabilitation policy for over 30 years but had practically no knowledge of neuroscience and often found the terminology to be rather inaccessible. Ruth saw herself as our yardstick for deciding when sufficient accessibility had been achieved, but we had a lot of interesting discussions about when a chapter was or wasn’t likely to be accessible enough to non-neuroscientists. We tried to get the authors to use minimal scientific jargon, and to write assuming a very basic knowledge of the topic. All were asked to provide explicit suggestions on the translation and application of the knowledge shared in the field. Perhaps a big ask, but could you distil the book’s main message into one short paragraph? There is clear neuroscience evidence to suggest that offenders and non-offenders perceive and react to their environment in a different way. In other words, their brains process information differently. These differences emerge through a complex interaction of genetic and internal and external environmental factors. Understanding how neuroscientific features contribute to criminal behaviour will improve our ability to understand and work with individuals who have committed crime. 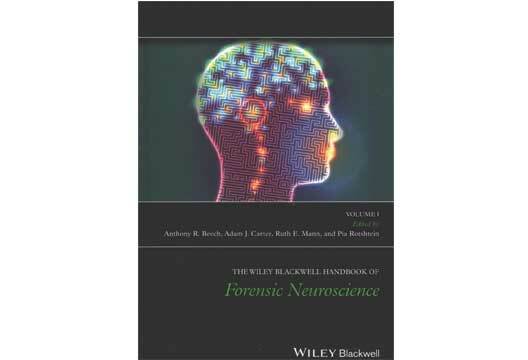 - The Wiley Blackwell Handbook of Forensic Neuroscience is available now, priced £35.99 as an e-book or £250 in hardcover. For your chance to win a copy, see our Twitter feed.